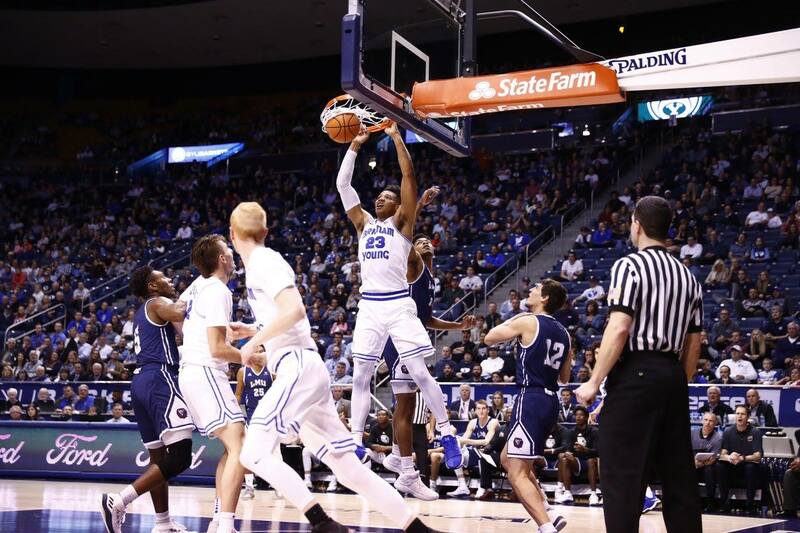 SAN DIEGO, Calif. — Foul trouble and a 10-0 San Diego run in the first half got BYU in a hole and the Cougars never recovered in a 75-62 loss to San Diego on Saturday afternoon in Jenny Craig Pavilion. Elijah Bryant and TJ Haws led the offense with 14 points apiece. Bryant added seven rebounds, three assists and three steals and Haws contributed five rebounds, five assists and three steals. Zac Seljaas scored 11 points while Yoeli Childs added eight. San Diego scored the first bucket of the game, but Bryant answered with his first trey to keep the game even at 3-all. The Toreros then went on a 5-0 run to take an early 8-3 lead. A pair of free-throws by Childs started a 6-0 run for the Cougars to go on top 9-8, their last lead of the game with 15:16 remaining on the clock in the first half. BYU went scoreless for over three minutes while San Diego went on a 10-0 run to take a comfortable 22-11 advantage with 10:45 to go. Bryant ended the scoring drought with points from the charity line, putting the deficit back to single digits, 22-13, respectively. Momentum began to return to the Cougars after a flagrant foul was called on the Toreros. Dalton Nixon went 1 of 2 from the line and then earned two more points from the charity stripe two possessions later. A basket by Bryant brought BYU within five, 29-24 with 4:12 remaining. The first half ended with San Diego scoring three consecutive 3-pointers and Haws hitting a pair of free-throws for a 39-28 Torero lead going into the locker rooms. San Diego shot 57.1 percent from the field and 50.0 percent from beyond the arc while the Cougars shot a season low 30.8 percent from the field and 7.7 percent from the 3-point line in the first half. The Toreros opened up the second half with five more points. Child’s hit two jumpers and a hook shot in the paint by Worthington put BYU within 10, 44-34 with 16:21 left in the game. A 7-0 run by the Cougars made it a two-possession game, 46-41 with 12 minutes to go, but free-throws kept San Diego in control. Six-straight points by Haws pulled BYU within seven points with 8:25 remaining on the clock. A 9-0 run by the Cougars that included points by Haws and Zac Seljaas made it a five-point game again, 61-56 with 4:25 left in the second half. Free-throws down the stretch secured the 75-62 win for the Toreros. San Diego shot 50.0 percent from the field, 42.9 percent from the 3-point line and 75.0 percent from the free-throw line. BYU ended the game shooting 37.0 percent from the field, 13.6 percent from beyond the arc and 90.5 percent from the charity stripe. The Cougars continue on the road at Portland as they play in their final regular season road game on Thursday, Feb. 22, at 8 p.m. PST. Live coverage will be available on ESPNU and audio broadcasts can be heard on BYU Radio (Sirius XM 143), BYU Sports Network and Easy 101.5 in St. George. Elijah Bryant totaled 14 points, seven rebounds, three assists, three steals and two 3-pointers. It was his 24th game scoring in double figures and 21st game with multiple 3-pointers. Zac Seljaas finished with 11 points, his first double-figure scoring game since Jan. 13. It was his fourth double-figure game of the season.